In addition to decorating a Christmas tree in the house, I like to give the birds a holiday tree filled with treats. 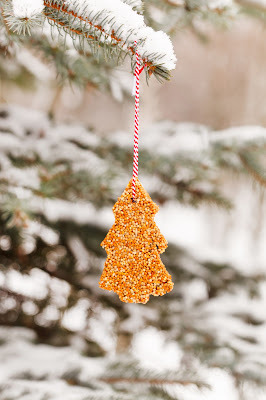 Making birdseed ornaments is also a fun craft to do with children during this season, especially the gooey part where you squish the mixture into cookie cutters. 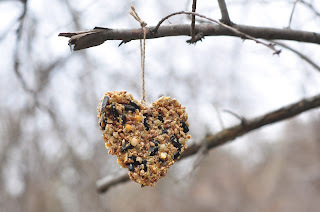 The gooiest ones are made with suet that you mix with birdseed, then press into cookie cutters. When you remove them from the cookie cutters, add a paper clip or string as a hanger, then put them in the freezer to harden. 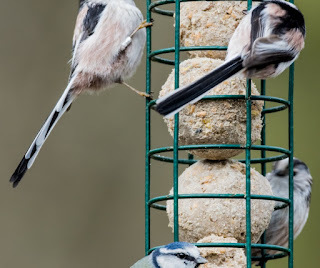 You can also make suet balls with nuts and seeds mixed into them. Heat the water and stir in the gelatin and corn syrup and remove from stove. Mix the flour and birdseed together in a large bowl. Add it to the gelatin mixture and let it cool. 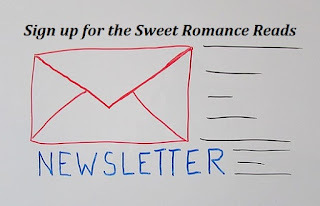 Place cookie cutters on parchment paper. Use the non-stick cooking spray here. Press the mixture into the cookie cutters. Make a hole with a toothpick or straw for the hanging twine. Carefully separate from the cookie cutters and let them dry for a few hours or overnight. Thread the twine through the hole. Do you have special things you do for wildlife at Christmas? Thanks for the motivation. I'm going to try this and fee the birds. I love to watch the birds at my feeder. Love your ideas for feeding birds.